Rolex is famous for its wonderful stories about the rare Daytona’s and many other vintage watches prized by collectors from around the world. The reputation of this brand is legendary throughout the world, known for its lavish and luxurious design as well as for its unmatched technical qualities. The Rolex Oyster Perpetual Datejust doesn’t fail to tarnish this reputation. This watch, while it may be somewhat underrated when compared to its siblings, combines the brand’s history with style and quality. The first Datejust was released in 1945 in order to celebrate the brand’s 40th anniversary, and this was the world’s first automatic wristwatch complemented by a date window, which changes automatically. This feature might be standard today, but back in those times it was a revolutionary concept in the watch making business. 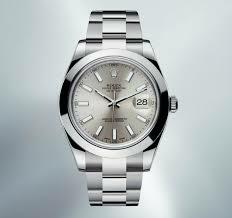 Today we have the Rolex Oyster Perpetual Datejust, which is the modern version of the vintage, anniversary watch. This watch can come in many different styles, giving the consumer the option to choose many combinations of metals bracelets and even dials. Today’s Rolex Oyster Perpetual Datejust is of a classic, 36mm size which offers a vintage style look on nowadays market which usually focuses on bigger watches. This wristwatch comes with the Oyster bracelet, which adds a more sporty and casual looks to it, making it possible to be worn on a regular basis. The old watch boasted a fancier, shinier Jubilee bracelet which wouldn’t work today in someone’s daily life, so they opted for the more modern Oyster instead. The modern Rolex Oyster Perpetual Datejust differs from the old versions, having Rolex trademarks at the bottom of the crystal making it much simpler when trying to detect a fake model. What fewer people know about this modern version, is that everything on the dial is manually applied and not with the use of machines, ensuring quality through a thorough procedure. The dial does try, however, to capture some of the old vintage feel of Datejust watches with its very subtle sunburst like texture, which used to be found in old models from the 60s. Also worth mentioning, is the modern Cyclops magnifying glass placed right above the date to make it easier to see. It is clear that the modern Rolex Oyster Perpetual Datejust is heavily inspired from the old version, trying to capture the historic feel of the company’s century-old path while also offering the most modern features. Using the most modern techniques Rolex tries to capture the vintage feeling with its newest Datejust, while maintaining its famous reputation for quality and expertise. The finest details are still done by hand to ensure the finery, which every Rolex user is accustomed to. Purchasing a Rolex Oyster Perpetual Datejust would certainly not be a mistake. This gorgeous watch has been designed for casual wear, and everyone can have a taste of Rolex’s esteemed quality and style without breaking the bank.